Henry III was King of England, Lord of Ireland, and Duke of Aquitaine from 1216 until his death in 1272. The son of King John and Isabella of Angoulême, Henry assumed the throne when he was only nine in the middle of the First Barons' War. Henry ruled England personally, rather than governing through senior ministers. He travelled less than previous monarchs, investing heavily in a handful of his favourite palaces and castles. He married Eleanor of Provence, with whom he had five children. 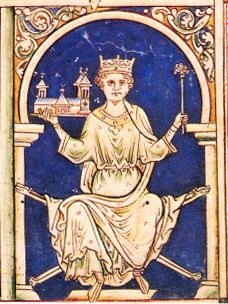 Henry was known for his piety, holding lavish religious ceremonies and giving generously to charities; the King was particularly devoted to the figure of Edward the Confessor, whom he adopted as his patron saint. He extracted huge sums of money from the Jews in England, ultimately crippling their ability to do business, and as attitudes towards the Jews hardened, he introduced the Statute of Jewry, attempting to segregate the community. By 1258, Henry's rule was increasingly unpopular, the result of the failure of his expensive foreign policies and the notoriety of his Poitevin half-brothers, the Lusignans, as well as the role of his local officials in collecting taxes and debts. In 1263, one of the more radical barons, Simon de Montfort, seized power, resulting in the Second Barons' War. Henry defeated the rebellion, but reconstruction was slow. He died in 1272, leaving his eldest son Edward as his successor.